This year I had to visit in Copenhagen and Stockholm. So I would like to share with you my findings about the chocolate in those countries. I'll start with Copenhagen as I visited there first. Copenhagen is the home to one of the best restaurant in the world by the name of Noma. This was my second visit in this colourful city. This time I had a full day and I decide to dedicate it to ramble in the city centre. Copenhagen is known of its designers and everywhere you see stylish shops and even the B&B was furnished in good taste according to the local standards. I couldn't resist though checking the chocolate shops in Copenhagen and I contacted Richard from Chocolate and Love who sent me a list of the best shops. 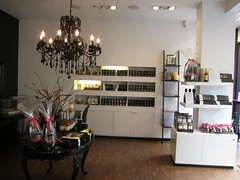 The first in the list is Summerbird on Kronprinsensgade 11 although they have a few shops. This boutique was the most convenient one for me to visit due to its location. The shop is small compare to the next onesI visited in the city. As a Scandinavian chocolatier I enjoyed the most from my purchase the liquorice wrapped with chocolate. Unlike buying the liquorice of the big brands, it's more delicate and will suit better the palette of a non Scandinavian. The next thing you should buy here is the Flødeboller. It's a chocolate coated marshmallow. According to Wikipedia it was first created in Denmark. Next on the list is A XOCO on Gammel Kongevej 115. It's the premium brand by Anthon Berg, which his chocolate bars I've seen in several Duty free shops worldwide. They experiment with unusual flavours so you might find chocolate truffle wasabi or filled with goat cheese. Opposite A XOCO located Peter Beier Chokolade on Gammel Kongevej 98, Frederiksberg. They stock huge range of chocolate and you can sit here and have hot chocolate. They make more traditional chocolate. I visited just before Easter which means it was snowy so I didn't look for any ice cream place and all the shops had Chocolate Easter eggs. If you're already visiting this area you and fancy something savoury you should try Meyers Deli, by the way they stock chocolate too. They stocked AMMA Chocolate which I discovered a couple of years ago in Salon du Chocolat in Paris. It hasn't reached the shores of Britain yet. The last one in the list is the department store Mad&Vin that has a deli floor including good selection of chocolate. 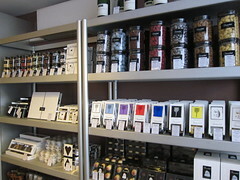 Here I bought the famous Scandinavian liquorice Lakrids but unlike the one of Summerbird you need to be a fan to like it. In the past Sugarsin in Covent Garden in London used to stock it, but I think they discountinued. Each flavour has different number. Some of them are coated with chocolate and others flavours. We cross the Øresund Bridge into Sweden and heading to Stockholm. I visited here in July and the day I arrived was very warm even in global standards so the first stop after I checked in to my hotel was StikkiNikki. It has several shops and one kiosk by the harbour which is open only during the summer. StikkiNikki was open by an American lady and it's probably the best ice cream you'll experience in Sweden. If you're courage enough try the liquorice flavour. I was recommended by Sugarsin in London to visit Chokladfabriken. They got a few shops in Stockholm and I visited the one on Renstiernas gata 12. You can glimpse into their kitchen and enjoy hot chocolate. They got seats indoors and outdoors. Please, don't call it marshmallow. That's not what you get in a Danish "flødebolle". It's a very soft meringue either on a marzipan base or waffle base. Come to Petworth Food and Wine Festival next weekend and you'll get the change to taste one of mine. See you. Hi Kim, do you still sell your products in any market?